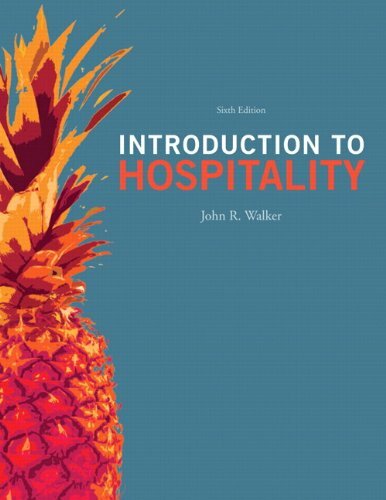 The Sixth Edition of "Introduction to Hospitality" focuses on hospitality operations while offering a broad, comprehensive foundation of current knowledge about the world's largest industry. Throughout, author John R. Walker invites students to share this industry's unique enthusiasm and passion. The text is organized into five sections: the hospitality industry and tourism; lodging; restaurants, managed services, and beverages; recreation, theme parks, clubs, and gaming entertainment; and assemblies and event management. Each section includes insight from industry professionals, contains up-to-date information on career opportunities, and includes many examples illuminating current industry trends and realities. Extensively revised and updated, this edition contains new photos, new page layouts, and new coverage on topics ranging from sustainability to globalization. Used Very Good (3 available) Great condition for a used book! Minimal wear. 100% Money Back Guarantee. Your purchase also supports literacy charities.